This crossroads between childhood and adulthood (“real life”) is symbolised by the Tiger Milk they drink: disguised in a plastic container of chocolate milk, it contains “a little of the school cafeteria milk, a lot of maracuja juice, and a decent slug of brandy.” The suggestion they need the comfort of milk reminds us they are still children; that they require the attitude of a tiger tells us about the inhospitable world they must survive in. Jameelah is insistent they tell no one what they have seen, even when another friend of theirs confesses to the crime; Nini is less certain. The friendship is put under strain as they are dragged unwillingly into a world of adult responsibilities as well as pleasures. 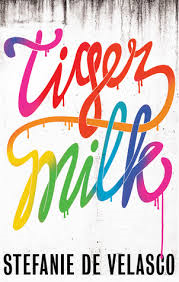 Tiger Milk gives the reader an insight into the world of working class teenagers in Berlin, and presumably in cities around Europe. There is a sense in which de Velasco presents Nini and Jameelah as typical – but this also makes it more difficult for them to stand out as characters. The community of immigrants is the novel’s most fascinating aspect, but as this is incidental to the narrator it remains in the background, though strangely fundamental to the novel’s plot. The novel was translated by Tim Mohr, who has also translated Charlotte Roche. Reading first person novels from the point of view of youthful protagonists, I wonder whether they are written in the particular register of the original country’s younger generation, almost impossible to translate into English without losing something (imagine Trainspotting in standard German, or even The Catcher in the Rye). This may be one reason I found this novel largely unaffecting. You are currently browsing the archives for the Stefanie de Velasco category.